Patients are weight bearing as tolerated with the use of crutches, a walker or a cane to assist walking until they are able to demonstrate good walking mechanics, then full weight bearing. No passive or active flexion range of motion greater than 90 degrees until stitches are removed. Early exercises should focus on recruitment proper quadriceps set. M.D./nurse visit after hospital discharge to change dressing and review home exercise program. Icing, elevation, and aggressive edema control (i.e. circumferential massage, compressive wraps). Soft tissue treatments and gentle mobilization to the posterior musculature, patella, and incisions to avoid flexion or patella contracture. 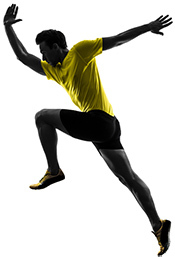 Initiate quadriceps/ gluteal sets, gait training, balance/ proprioception exercises. Straight leg raise exercises with proper quad set (standing and seated). Passive and active range of motion exercises. Range of motion <90 degrees (until stitches removed). Nurse visit at 14 days for stitch removal and check-up. Continue with soft tissue treatments and gentle mobilization to the posterior musculature, patella, and incisions to avoid flexion or patella contracture. Continue with home program, progress flexion range of motion, gait training, soft tissue treatments, and balance/proprioception exercises. Incorporate functional exercises as able (i.e. seated/standing marching, , hamstring carpet drags, hip/gluteal exercises, and core stabilization exercises). Range of motion < 10 degrees extension to 100 degrees. M.D. visit at 4 weeks. Pool work outs once incisions completely closed. Range of motion < 5 degrees extension to 110 degrees. Continue soft tissue treatments, joint mobilizations, patellar glides to increase range of motion. Patients should be walking without a limp. Range of motion should be 0 to 115 degrees. Range of motion with-in functional limits. Return to all functional activities.